A police action and protest turn violent in Latté Da’s production of Ragtime. Photo by Dan Norman. Is musical theatre relevant or mere entertainment? The musical Ragtime deals with immigration, economic disparity, and the killing of unarmed blacks by police. 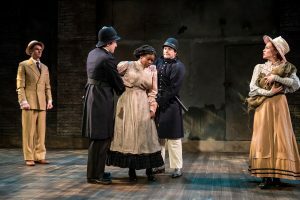 Although Ragtime is a period drama set in the United States near the start of the 20th century, the issues at its heart are unfortunately very much alive today. Ragtime is an adaptation of the 1975 novel of the same name by E.I. Doctotrow; its 1998 Broadway debut garnered nominations for 13 Tony awards and 4 Tony Award wins. The original Broadway show had a cast of 30, but Director Peter Rothstein smoothly uses a slimmer ensemble cast to convey Theatre Latte Da’s rendition of this musical, which opens Theatre Latté Da’s new season in its newly purchased home, the Ritz Theatre in Northeast Minneapolis. .
Sarah (Traci Allen Shannon) is accosted by police officers Benjamin Dutcher and Daniel S. Hines, while Little Brother (Riley McNutt) and Mother (Britta Ollmann) look on. Photo by Dan Norman. The needless murders by police of the two main black characters give the show a very chilling relevance today. The central storylines follow three families: a well-to do traditional couple with a mother, father and son; a ragtime black musician by the name of Coalhouse Walker and Sarah, the mother of his newborn son; and a newly arrived impoverished Jewish immigrant by the name of Tateh and his young daughter. The characters are connected by association with several better known names of the era including Harry Houdini, Evelyn Nesbit, Henry Ford, J.P. Morgen, Emma Goldman, Admiral Perry, and Booker T. Washington. A central character, Mother, interacts with all three families. Director Rothstein’s casting of a very enthusiastic and talented ensemble elevates this production. Chief among these are Britta Ollmann as the Mother character. Ollmann successfully conveys a woman who, after her husband leaves for a trip to the North Pole with Admiral Perry, finds her opportunity to break out of her traditional role to become independent, assertive, and compassionate. Her passionate rendition of the ballad “Back to Before,” is one of the highlights of the show. Scenic designer Michael Hoover uses sparse set pieces such as two moveable scaffold stairs, a piano and the use of two existing stage doors to effectively create multiple locations. Lighting designer Mary Shabatura’s incredible lighting works well with the sparse set to lift the scenes outside of the three warehouse type walls that create the stage. I have seen four outstanding shows so far this year; Ragtime and Theatre Latté Da’s earlier C are two of these four. This production is not only very entertaining, its glaring relevance to today’s America reaches to the very heart.